January is the perfect time of year to be thinking about goals and aspirations. And a really good way to keep those goals at the forefront of your mind is to present them visually. So how about sitting down with the children, with some paper, old magazines and some glue, and while they busy themselves making a collage, you try your hand at making a Vision Board. Business coach Nicola Douglas tells you how. It’s just a fun, fresh and funky alternative to traditional forms of written goal setting. If you are a visual person you will just love it! If you aren’t visual, then try this as a great way to get a different perspective. Simply put, a vision board is a collage of images; pictures; textures; words; phrases; colours and affirmations that represent your goals and desires. They are sometimes called ‘dream boards’, ‘treasure maps’ or ‘vision maps’. Why you should make one? Vision boards are very flexible goal setting tools and can be used to great effect to represent your business goals. Every dream you have for your business is a valid contender for a place on your board. The size of your goals is not an issue. Goals can be short, medium or long term. You could even time zone your board to show what you want from a business at different points in time. You can represent one or multiple goals on the board. 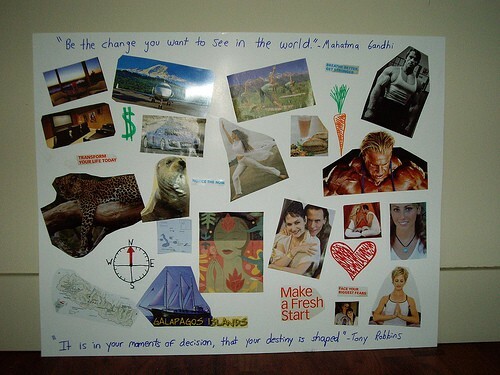 One of the major benefits of making a vision board is to work on your goals at a subconscious level. In terms of achieving your goals, the subconscious mind is a powerful driving force that you can harness! By making a vision board and focussing on what you want every day, you are strengthening and reiterating your thoughts; concentrating them until they grow stronger. A visual representation of your goal, placed in a prominent position helps you to intensify your thoughts and draw in bigger rewards. It lets your subconscious mind get to work. As a consequence, you will start to move towards your goal with greater ease, every day. A bundle of various types of magazines, Sunday supplements, travel brochures, business publications, etc. Personal pictures, fabric, glitter, stickers, coloured pens / pencils / crayons etc. Now, spend some time thinking about what you really want from your business. What do you want the future to hold? What do you desire most? Be as precise as possible. If you want more customers, think about how many customers; who they are; what they do; where they live; how they spend their weekends? Build up a really strong image. N.B. There are no limits to the number or variety of goals you can put on your vision board; however I would recommend that you aim for 1-4 goals if you want to try this for yourself. Grab a pile of magazines and find the pictures, words, colours, textures, etc. which embody the goal for you. Cut them out and make a pile of the stuff you want to use. Review this stack and discard any which at second glance don’t feel right to you. Start to position these roughly on a piece of coloured card (A3 – A1 sizes are ideal). Check again! Is there anything which looks out of place, doesn’t quite fit or feels wrong? Is there a specific image you want but haven’t found? (You can always print something from the internet if you need to). When you are happy, stick your cuttings to the board and add any embellishments (ribbon, glitter, stickers, hand drawings, handwritten words or phrases) to emphasise your goal. As a Mum and a business woman, you probably think that you don’t have time to create a vision board. I’d say, get the children involved too! What better way to spend a cold winter’s afternoon than with your children making a collage? Last year I did this with a friend and her 5 year old daughter. Nicola Douglas is a qualified coach, project manager and business owner. Her business The Entrepreneur’s Advocate, focuses on helping creative, right brain entrepreneurs. She helps them to make more of their opportunities by fusing her left brain business skills, mentoring and coaching with her client’s right brain, imaginative business ideas. A perfect plan id require for either starting a business or to enhance that business again. This included both the knowledge of the business strategy where the global market techniques used to involve in this method.